I’ve spent the last week on South Manitou Island clearing trails. I know that sounds pretty straight forward, and perhaps somewhat dull, but this trip was made special for me by an unusual man. For me this trip began like trips to North Manitou Island. I arrived on the South island on Monday and got settled in, and had my lunch prior to starting work Monday afternoon. On this particular trip I was part of a larger group of Volunteers, but we were broken up into smaller work crews, some performing maintenance tasks around the village area, some performing historic restoration projects, and our crew, who were going to clear trails. Having hiked most all of the trails on South Manitou, I was very comfortable in what I was going to be doing, and I was very familiar with the areas that we were going to be working. This knowledge alone placed me in the crew leader position on Monday, but that was soon to change. Monday over lunch our coordinator, the Park Staff, along with myself discussed the areas that we felt needed the most attention in regards to trail clearing. We developed a work plan for the week, but I was told that I would need to take lunch back at the village on Tuesday so that I could meet another member of our crew that was coming in on the Tuesday ferry. All that I was told at the time was that he was an older gentleman, and that he had family ties to the Island, and like me he requested to clear trails. I know that it’s dreadful that I had these initial thoughts, but for the sake of honesty I must say that I had them. My mental vision at the time was of an elderly man who would slow down our crew, and those of someone who I would need to watch all the time to make sure that we weren’t pushing things to hard. We gathered for lunch on Tuesday at the village and I was introduced to Jack who had just arrived on the ferry, and who was just setting down for lunch. Again for the sake of honesty my first impression of Jack’s rather slow and deliberate demeanor during lunch had me forming a mental image of guy that was going to be holding up the progress of our crew, but nothing could have been further from the truth. Much of the work we would be doing during this week would be on the Chicago Road trail. The trail runs due west from the site of the old wharf out towards the center of the island to the area that is known as the Farm Loop. The Ohio Road is the dark line that can be found on most maps that runs north and south across a large part of the island. The trail that is the most overgrown is the section of the Chicago Road that runs east to the bay from the intersection of Ohio and Chicago and this would be the area where we concentrated much of our clearing efforts. After lunch Tuesday there was a work crew heading out to do some building restoration work at one of the farms in the Farm loop. The Farm loop is accessible by vehicle, and is an area were guided tours are given by a tractor towing a trailer load of people down two of the old roads on the island. The tour leaves the village area heading west down Burdick road to the intersection of Ohio road where they turn north to the intersection of Chicago road, turning west again on to the Farm loop road. Chicago road to the bay is only a foot path and this would be the place that we would be dropped off to start working our way from the center of the island towards the bay and the site of the old wharf. We loaded all our gear and equipment into the park service truck and headed out with the crew that was going to be working on one of the old farm houses. Setting up on the tool box that stretched across the bed of the pickup with Jack beside me, I immediately recognized that Jack had a great sense of humor as he interjected a slew of one-liners into the conversation as the truck bounced down the dusty road. Jack appeared to be known and loved by everyone on the truck, park staff and volunteers alike. We hopped off the truck at the intersection of Chicago and Ohio, bid our farewells’ to the crew remaining on the truck and began clearing the trail heading east. My initial thoughts about Jack slowing down our crew were quickly proven quite the contrary. With pruning shears in hand, Jack proved himself to be quite the mad-man who had the pace of a 20-year-old. I found myself dropping hints to Jack that it was probably time we took a little break. Not long after starting down the trail I found myself chatting with Jack, and it was at this point that he began to pour out his heritage and family lineage on South Manitou Island. And it was also at this point that Jack told me that his Great-grandfather was buried in the Bay Cemetery that was near the end of the trail that we were clearing. The Bay Cemetery only contains 4 marked graves, and only two of those have stones, Jack said that one of the long ago fallen over stones was that of his Great –grandfather. Jack also told of how his Grandfather had been the Lighthouse keeper for 12 years starting in 1866, and that Jacks Grandfather and Great Uncle had farmed an 80 acre farm near the north end of Lake Florence. As the week progressed Jack turned out to be a venerable walking history of the island who knew every nook and cranny of every old building that was standing and he knew the location of almost all the buildings that were gone. One evening after supper Jack took some of us up to the lighthouse and keepers quarters where he gave us an amazing tour of the buildings and the light. Jack talked of how the building was constructed, and of how the people who lived there over the years had made changes. He told us of how the buildings were abandoned and then reclaimed by the National Park Service years later. Perhaps Jack’s most memorable story of the evening was of how his Grandfather and Grandmother were heading out from the light towards the mainland in a small boat when a freak storm came up capsizing the boat leaving his father and his siblings orphans. He told of how the bodies were never recovered, and how a marker was placed at the main island cemetery for them only a few years ago. Jacks storytelling made for a memorable experience to say the least. Of the volunteers on the island this past week, 3 of them had family ties to the island, so it was an amazing experience to hear the stories that had been passed down through the generations and to see their attachment to the island, and this attachment provided enlightenment to why they came back to volunteer year after year. I must say that Jack was by far the most memorable man on the island in my mind. His deep caring nature, his love of the outdoors, and his love of the history of the island made him a magnet to the people around him. His humor reminded me of that of my late grandfather. His witty quips and one line jab’s could be delivered with the straightest of faces to the unsuspecting raconteur during any conversation. Jacks stage humor was memorable as well, and I will never forget how on Wednesday a serious conversation was going on over the reliability of dowsing rods, in which about half the group were staunch believers in the practice, and the other half chalked it up as pure hokum. One person had brought along a set of dowsing rods and the conversation was becoming rather heated when Jack interjected that he… in the past had successfully located items underground using dousing rods, and that he would be willing to demonstrate the correct method proving beyond a shadow of a doubt that the practice did in fact work. The “believer” crowd lit up at the prospect of Jack demonstrating to the “Non-believers” how exactly one used a set of dowsing rods. Jack sprung to his feet with dowsing rods in hand immediately stating that he was so good with them that he only needed one. The believers looked puzzled by this statement and then Jack took the other dowsing rod and started probing the long end of the rod into the ground looking for something solid, and it wasn’t long before he came upon a rather large rock buried just below the surface. Digging the rock out with his heel, Jack declared his successful use of dowsing rods to locate subsurface items. As one could imagine, the crowd on both sides roared with laughter. Jack made this a trip that I will not forget for years to come, and I’m so happy to have had the opportunity to meet this incredible man. 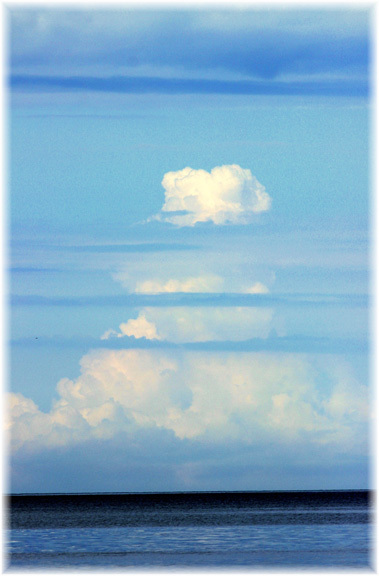 Well……our fearless leader is back to the Manitou Islands again. 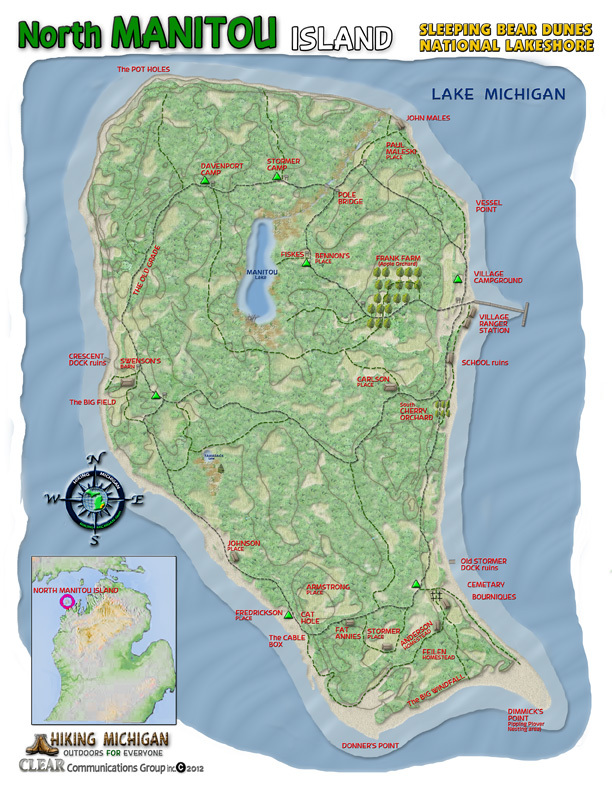 This time he is working on the Trails system on South Manitou Island. He has also been meeting with Park staff to set up some working trips to both Islands next Spring for Hiking Michigan members. details will be coming on those planned weekends soon. The basics will be some BackPacking, while we clear the Trails as we go. We have done this kind of Trail work at some of the Southeastern Michigan Parks. Not even like work, if you ask me. And to Hike back over your cleared trails has a sense of accomplishment I have not felt in any other way of giving back to my Park lands. 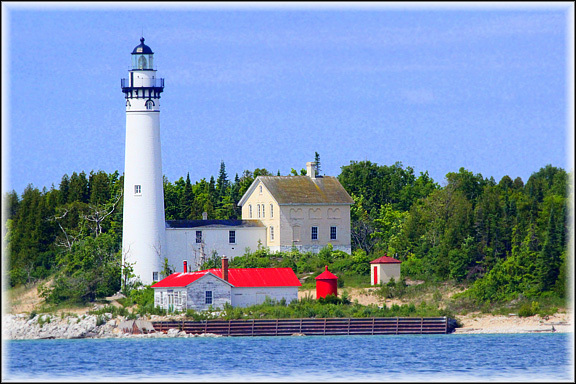 Our director for the Hiking North/Central Michigan Group, will be returning from his second trip to North Manitou Island this week. 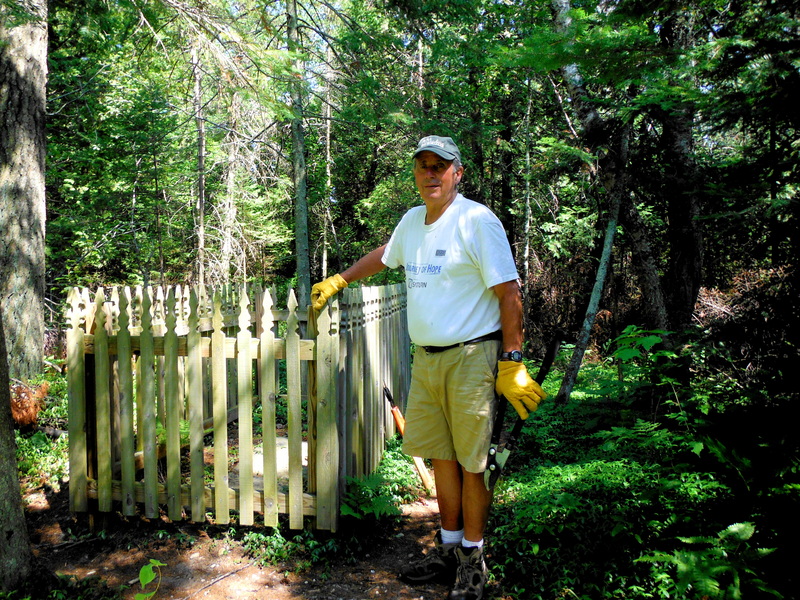 He has spent the last two weeks, on and off, assisting the National Forest staff in maintaing and restoring some of the Trails and Historical buildings on the island. We are looking forward to many pictures and some tall tales of his experiences there on the Island. 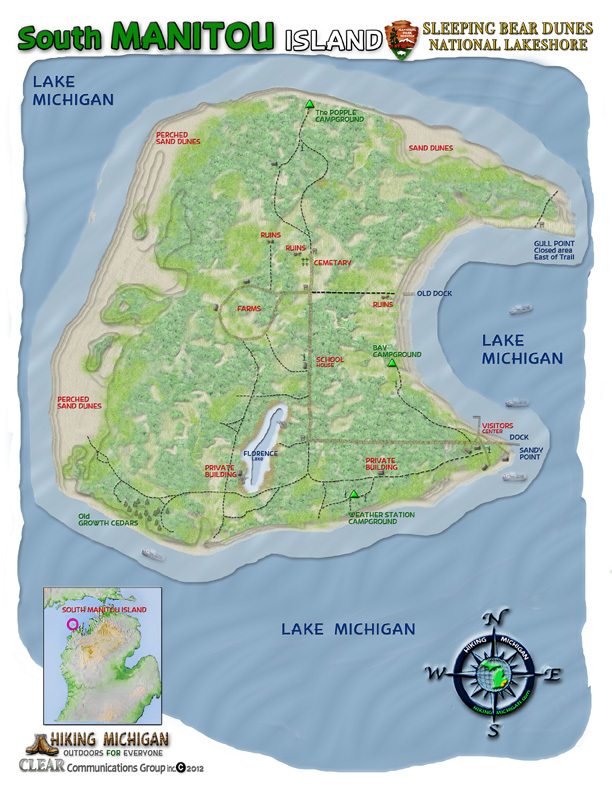 We also hope to organize a small group of Volunteers through Hiking Michigan, to return to the Island, next Spring to continue some of the Trails work started this year. Look for more details on this, when Mark returns shortly.